On the twisty, slippery road to appreciating Jazz, I think Chris Rea will be a big help to us. His career took a radical turn a few years ago when he decidedly moved away from popular music. This album, to my mind one of the best he recorded in his transitional phase, is the perfect link for us between smokey voiced 'bad guy' Blues like Calvin Russell and Jazz. Chris adds a taste of Jazz to The Blues in this CD where he growls in a deep, smokey voice with his usual strong bass line and slide guitar licks but in a more laid back, reflective mood. Most people probably know Chris Rea as the guy you hear on the radio every year around Christmas time with his Driving Home for Christmas. People who were alive and in contact with the world in the 80s will know him as the artist behing big popular hits like The Road to Hell, Auberge, Josephine, Looking for the Summer... After his initial huge success, he disappeared completely in the 90s and produced some truely AWFUL albums. His great comeback came in 2002 when he released Dancing down the Stony Road, recorded "live in the studio", i.e. one take tracks. Chris created his own record company called Jazzy Blue and released an extended version of that album with his new company. He has released a whole flurry of albums since, now having the freedom of release what and when he wants. The result is, in my opinion, a dramatic improvement in his music. He has now turned to a genre you could call "Dark Blues" and The Blue Jukebox is a great example of it. Chris is faithful to his usual sound instrument-wise in this album: his voice, slide guitar, bass and a slow blues shuffle on the drums. The novelty is the appearance of a saxophone which occasionnally softly fills in between the guitar and the voice, adding a destinct Jazzy tone. Athmosphere-wise, The Blue Jukebox is Dark Blues at its best. Technically, the music is simple, very rootsy, no ornaments, no excessive multiple tracking. Every sound you hear has its function and would be noticeably missed were it to be left out. The mood produced is slow, weary, dreamy. 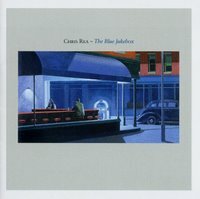 The album musically describes to perfection the feeling of "being blue". The difference to traditional Blues is that it's not the groans of someone trying to free himself of this unfortunate state of mind but simply a description of it and a much more expressive and moving description than words. The Blue Jukebox is a very accurate title for this CD: it is the sound of "blue". The most easily likeable track is certainly Long Is the Time and Hard Is the Road. Lyrically the song is quite similar to Chris's old hit The Road to Hell. He criticises the way society works, showing how fake and meaningless our way of living is, leading us to self negation. However, unlike the old hit, he doesn't express his anger and his wish to change this, he simply describes the sadness he feels towards the situation. Musically this is expressed by a strong, warm and slow bass line. The anger which used to be his screaming, screeching guitar, is replaced by a gently weaping slide guitar. I must say you have to give credit to Chris for his performance on guitar on this album. It takes a great deal of subtely to express deep sadness and yet keep the sound gentle and soft. as if he was trapped in his sadness. As if he couldn't bear being happy, that he prefered staying in his familiar and gentle world of sadness. The song ends with a really impressively well executed duo of saxophone and slide guitar. I think this album is a great introduction to the bluesy/jazzy mood. In his lyrics, Chris often speaks of a "blue world" or "a little piece of blues" as if the blues could be sensed in every situation. Even in a happy event, you can catch a glimpse of sadness which you can be fascinated by, attracted by because of its familiarity giving you a sense of security.